Don’t let the dark keep you from grilling a delicious meal! Use this 2-in1 BBQ grill light to turn night time darkness into a brightly lit grilling session under the night’s sky. It is perfect for outdoor grilling and BBQ because it provides instant illumination exactly where you need it! It can be either mounted using the magnetic base to any metal surface or attach to any surface by using the screw clap. 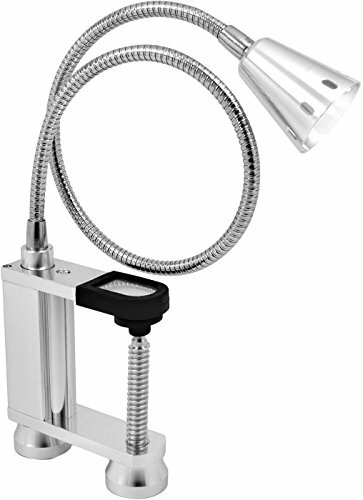 The sturdy, magnetic base ensures that the weight of the extendable light won’t topple over. It attaches to a variety of surfaces while providing just the right amount of illumination. Simply attach to a metal surface or use the screw clamp, insert batteries, and turn on for instant illumination! The adjustable light has 12 super-bright LED bulbs that are reliable and energy –saving. The 22 Inch goose-neck light adjusts 360° to brighten up your space. This battery operated task light brings convenience and ease while you’re cooking by not having to search for an outdoor outlet nearby. To replace batteries unscrew the magnetic base not associated with the clamp. It is made of durable, heavy-duty aluminum and is weather-resistant. Perfect for mechanics, handymen, outdoor work, and indoor work as a task light providing cordless lighting whenever and wherever you need it. Become the ultimate grill master with LED Concepts Flexible LED BBQ Grill Light! View More In Outdoor Cooking Tools & Accessories. If you have any questions about this product by LED Concepts, contact us by completing and submitting the form below. If you are looking for a specif part number, please include it with your message.